New Volvo Excavator 1.56-1.84 tonne £ Price on application Strong and tough with the performance to match, the EC15E is a small machine packed with big features, designed to promote low operating costs. 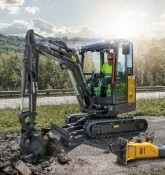 This new excavator is available now from SM Plant Limited, along with other new Volvo plant. New Volvo Excavator 1.88-2.12 tonne £ Price on application Go where other machines cannot with the compact design of the EC20E. Easy to operate and easy to transport, this 2t excavator is the perfect choice. New Volvo Excavator 1.73-2.10 tonne £ Price on application Built for durability and easy to service, the EC18E compact excavator will make light work of tough jobs.